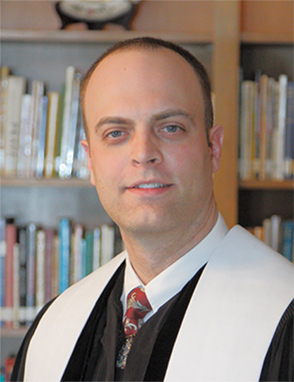 Trajan became Westminster’s Associate Pastor for Parish Life in February of 2015. Prior to entering full-time ministry, he received a Bachelor’s Degree in Computer Science from Harvard College in Cambridge, MA, and worked for several years in software development, going on to earn a Master of Divinity degree at Princeton Theological Seminary, in Princeton, NJ. While there, Trajan was a member of the PTS Touring Choir and served as a volunteer firefighter and officer in the Princeton Fire Department. Having grown up in Illinois, Trajan is pleased to be able to serve a church in the heart of the Midwest. His pastimes include a lifelong enjoyment of music and a continuing interest in technology. Trajan is married to the Rev. Sarah Iliff McGill, and together they have a son, Scott Wilberforce McGill and a daughter, Daehler McGill.